Our Secret? HIIT works & Here are 3 Reasons why! Living in Dubai, it can be difficult to find regular times in your routine to workout. We all know that physical activity is required every day to stay healthy, in fact one study shows that maintaining a physically active lifestyle can have beneficial effects on mental and physical health well into old age. Many experts agree that 30 minutes seems to be the magic number when it comes to daily exercise or physical activity in order to help people lose weight, but wouldn’t it be amazing if you could supercharge that 30 minutes or hour long exercise session so your body’s metabolism is burning more fat for a much longer period of time? High Intensity Interval Training, or HIIT for short, is a type of workout that involves short periods of intense exercise at max effort alternated with periods for recovery. 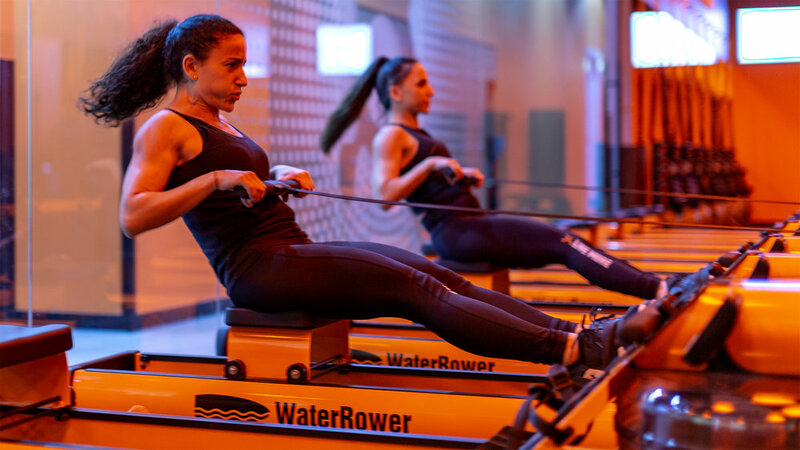 Orangetheory’s workouts are based on the science of HIIT, which is increasingly becoming recognized as one of the best ways to lose weight all over the world. The BBC recently covered a report in the prestigious British Journal of Sports Medicine which analyzed the results of 36 studies and found that participants engaged in HIIT exercise lost 28.5% more weight! HIIT burns a HUGE number of calories, an average 75kg person can expect to burn up to 756 calories in one hour of HIIT based workout. Scientific research has proven that HIIT burns up to 30% more calories than other forms of cardiovascular exercises in the same time period, which means you can burn the same number of calories in 30% less time! Scientific studies have conclusively established the positive impact of a HIIT workout on your metabolic rate for hours after your workout. We have found that your metabolic rate can remain elevated for up to 36 hours, as your body recovers from the workout, burning an increased number of calories in order to do this. Studies have found that HIIT’s impact on your metabolism is greater than either jogging or weight lifting! Your muscles ability to use oxygen is vital, developing this is often a goal in endurance training. The better your muscles are able to utilize oxygen, the slower the lactic acid build up and more stamina you have. Traditionally, athletes would have looked to long distance running or cycling at a steady rate in order to help build up stamina and endurance, however studies have shown that HIIT workouts can have the SAME benefits in a shorter period of time!